sits beside Loch Ness in the Highlands of Scotland. The castle is on the A82 road, 21 kilometres (13 mi) south-west of Inverness and 2 kilometres (1.2 mi) east of the village of Drumnadrochit. The present ruins date from the 13th to the 16th centuries, though built on the site of an early medieval fortification. Founded in the 13th century, Urquhart played a role in the Wars of Scottish Independence in the 14th century. It was subsequently held as a royal castle, and was raided on several occasions by the MacDonald Earls of Ross. The castle was granted to the Clan Grant in 1509, though conflict with the MacDonalds continued. Despite a series of further raids the castle was strengthened, only to be largely abandoned by the middle of the 17th century. Urquhart was partially destroyed in 1692 to prevent its use by Jacobite forces, and subsequently decayed. 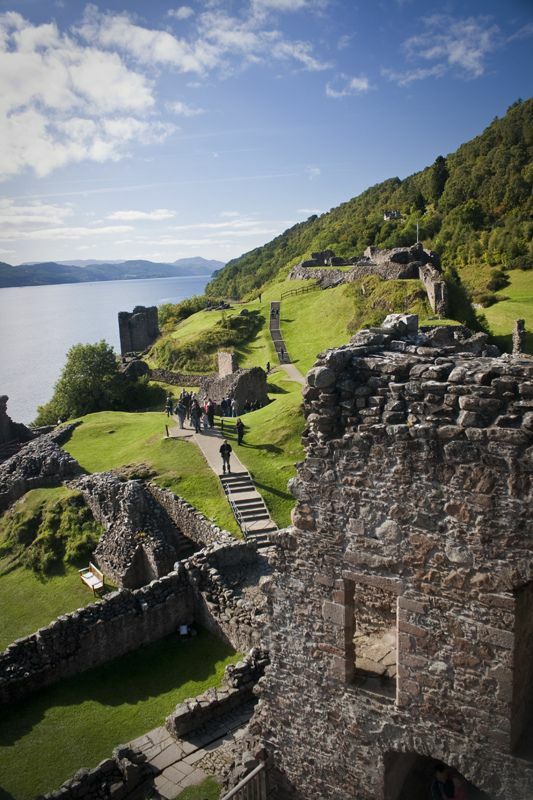 In the 20th century it was placed in state care and opened to the public: it is now one of the most-visited castles in Scotland.The castle, situated on a headland overlooking Loch Ness, is one of the largest in Scotland in area. It was approached from the west and defended by a ditch and drawbridge. The buildings of the castle were laid out around two main enclosures on the shore. The northern enclosure or Nether Bailey includes most of the more intact structures, including the gatehouse, and the five-storey Grant Tower at the north end of the castle. The southern enclosure or Upper Bailey, sited on higher ground, comprises the scant remains of earlier buildings.